insignificant—one is out of reach beyond a bramble patch and the fruit of the other is consumed by field rats before it even ripens. Luckily, my friend Charlotte has a garden where figs thrive. One enormous, sprawling tree is laden with fruit. Several smaller trees bear different varieties of figs. Charlotte used to dry her figs, spreading them on tarps in the late summer sun. They were then packed in a woven basket, cinched tightly and taken to a fig press. Pressing preserves the figs and keeps out bugs. With a reduced household, she can no longer make use of quantities of dried figs, so she doesn’t bother with drying anymore. 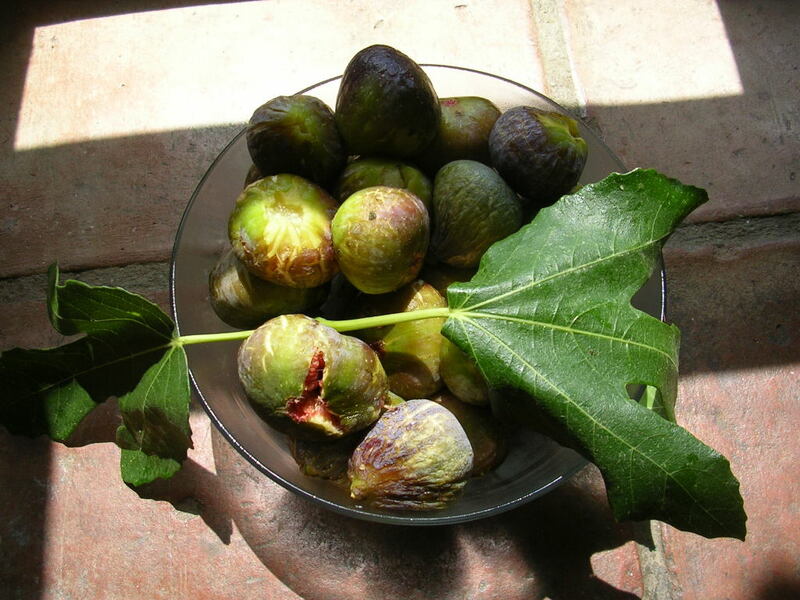 She gives away fresh figs to all comers—including the washing machine repair man who took away 10 pounds of them. 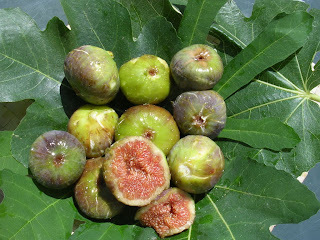 As a favored friend, I have all the figs I can possibly eat. I have several favorite ways with fresh figs. Figgy ice cream (see the previous blog posting for the recipe) is one. I adore fig and chicken salad with tarragon dressing, a recipe I culled from Gourmet magazine many years ago. Figs pair beautifully with thinly sliced serrano or ibérico ham, making a simple but elegant starter. I’ve made fig jam and fig chutney, but, in fact, I prefer not to cook ripe figs. 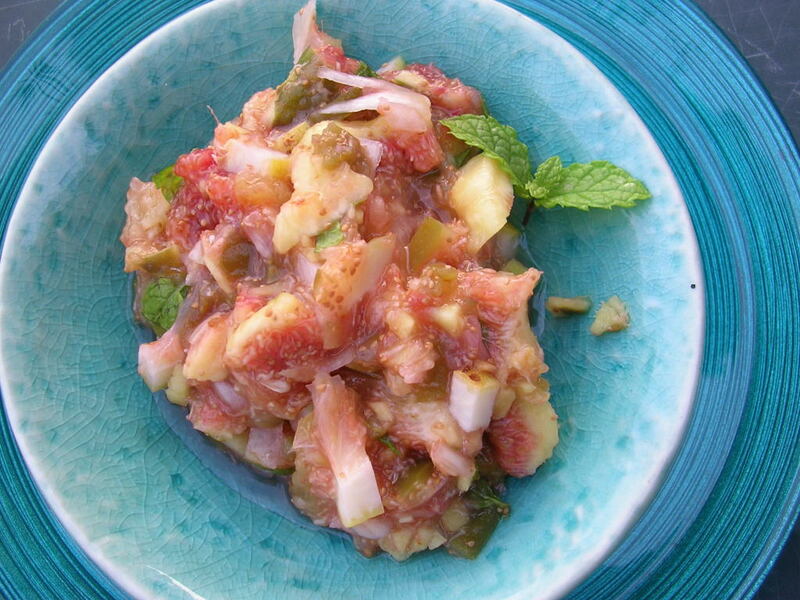 That’s how I came to invent this fig salsa. It goes beautifully with foods from the grill. I especially like it with pork, lamb chops or chicken breast. Yesterday I served it with pan-fried pork tenderloin. I've got the leftovers to spread on a chicken sandwich. The salsa is juicy and piquant, just right for summer meals. It keeps, covered and refrigerated, up to 2 days. Makes 1 ½ cups salsa, serving 6 as an accompaniment. Blanch the chopped lemon in boiling water for 1 minute and drain. When it is cool, combine the lemon with the figs, shallot, jalapeños, ginger, salt and lemon juice. Chill for at least 1 hour before serving. Stir in mint leaves before serving. Frosty and refreshing--prickly pear sorbet. 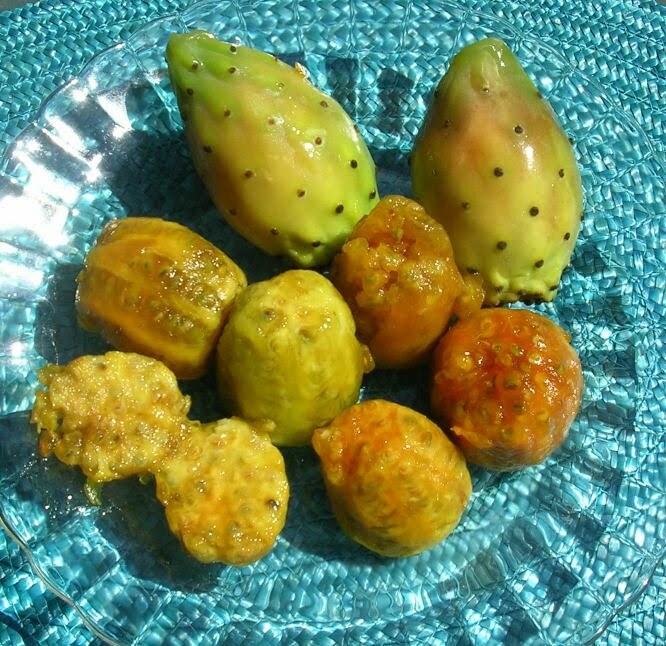 Yesterday, on the steps of the local market, a kid was selling higos chumbos, prickly pears, the fruit of the cactus. Wearing gloves to protect his hands from the spines, he deftly sliced the ends from the egg-shaped fruits, slit open the skin and unwrapped the yellow-orange fruit. Chumbos are an emblematic fruit of high summer in southern Spain, when August heat can soar to 40ºC (104ºF). 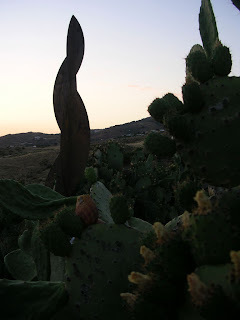 The cactus grows readily in the arid countryside, where once it was used as primitive fencing, to keep farm animals in and intruders out. The fruit, sweet and very juicy, is an antidote to summer doldrums. Cactus with flowers and fruit alongside a sculpture, "Fibonachi," by Paffard Keatinge-Clay. But when I got home with my bag of peeled fruits, I remembered why I’ve never much liked chumbos—they are full of small seeds. The locals say you eat the seeds, but I don’t. While they won’t break your fillings, the hard kernels are really not very nice. So, I plopped the chumbos in the blender, buzzed them until pureed, then sieved out those annoying pips. 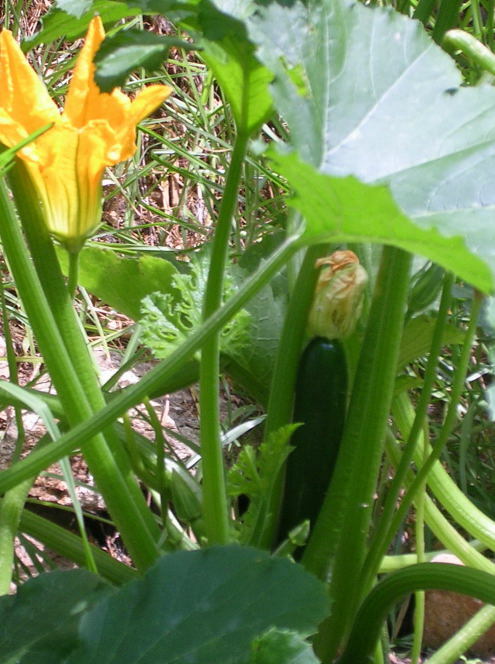 The puree—more of a thick juice than a pulp—had a refreshing flavor. How to describe it? Citrus blended with tropical fruit and watered down. Very nice. Perfect for making an icy-cold sorbet. Well, not a true sorbet, which is made with only fruit and sugar syrup. My sorbet is really frozen yogurt. My beloved ice cream freezer broke a few years ago. That little machine, a Braun, required no ice or salt. It was placed inside the freezer compartment of the fridge—electric cord trailing out to the nearest outlet. Perhaps it didn’t meet safety requirements, for I have never seen another one like it. I place the fruit, yogurt and sugar in a deep bowl and puree them with an immersion blender. I pop the bowl in the freezer until the mix is partially frozen, then blend it again until very smooth, incorporating some air into the mix. I pour the mixture into individual bowls, cups or glasses. That way, I can remove one, two, four or six servings from the freezer without having to soften a whole bowl of it. The basic recipe works with any fruit puree. 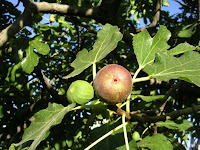 August figs, ripening now, make a delightful sorbet, but nectarines, peaches or mangos are good as well. I originally made this sorbet using non-fat yogurt and artificial sweetener, in order to have a low-cal, low-carb dessert. Needless to say, full-fat yogurt is so much more delicious. chopped mint adds to its refreshing flavor. Figs go well with vanilla, but I have experimented with a pinch of thyme instead. I like grated fresh ginger with mango and chopped basil with nectarines. A spoonful of Sherry, wine, brandy, gin, rum or liqueur adds flavor and the alcohol keeps the sorbet from freezing quite so solid. Puree the fruit with the lemon juice. Sieve the puree to remove seeds. Blend again with zest, yogurt, sugar and flavorings such as herbs and Sherry. Place the bowl in freezer until partiallly frozen, about 2 hours. Blend again until mixture is smooth. Spoon into 6 glasses or dessert cups. Freeze until solid. 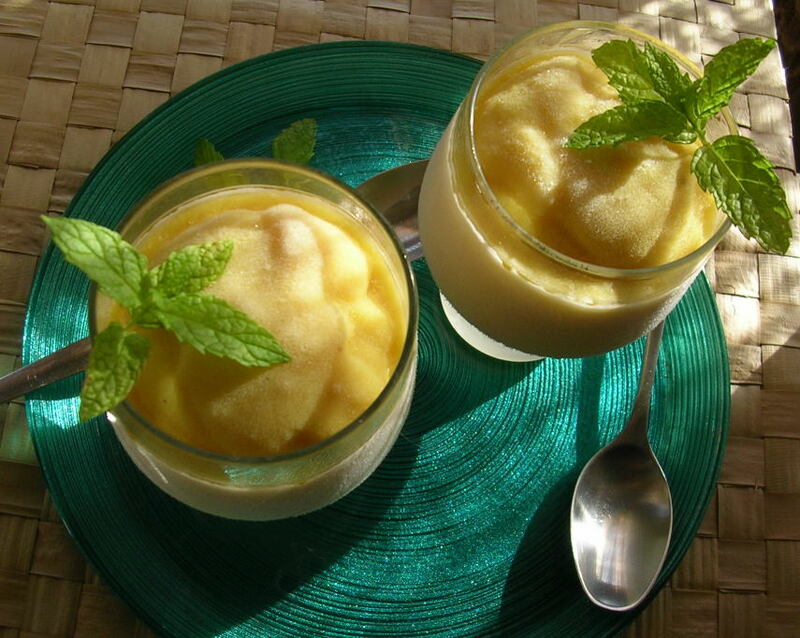 To serve, remove the glasses from freezer and let the sorbet soften for 15 minutes before serving. 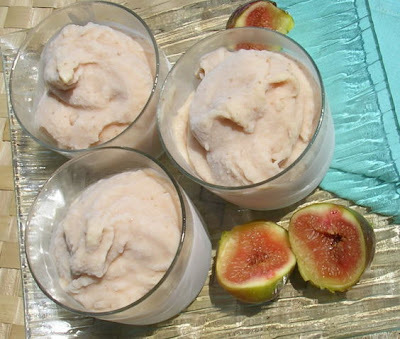 Frozen yogurt with fresh figs. Observer Food Monthly's 50 best cookbooks puts TRADITIONAL SPANISH COOKING at #25. First published in 1996, TRADITIONAL SPANISH COOKING won the André Simon award for cookbooks in 1997. The current edition, a soft cover, was published by Frances Lincoln (U.K.) in 2006. 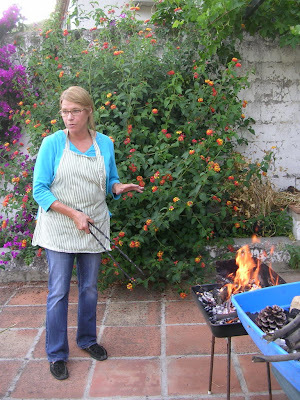 Journalist Mendel is an American who has lived in southern Spain for more than 30 years, immersing herself in the country's culture and cooking. This is an authoritative blend of both, with little asides – crema catalana is the Father's Day dessert of choice, apparently – making it more than just a thorough compendium of recipes. This book can be ordered from the Guardian on-line bookshop (link on that web page) or by clicking on the image of the book in the column to the left. 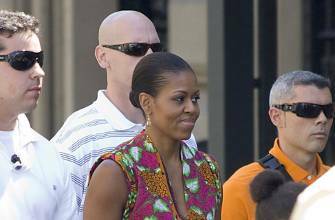 Michelle Obama is vacationing on the Costa del Sol (southern Spain)! She and younger daughter, Sasha, and some friends are staying at a posh resort hotel in a village just a few miles up the road from where I live. I am intrigued that she is here and very interested to know if she’s tasting really great Spanish food. Here’s what’s been on Michelle’s menu so far. Dinner out in the old town of Marbella (Restaurante Buenaventura), Michelle and her party dined on the patio, ordering fresh fish and shellfish, finishing with a warm chocolate cake and torrijas de almendras (custardy fried toasts with almonds). They drank a red wine from Ribera del Duero and finished with sweet Málaga moscatel. During dinner, she received a call from Barak Obama—and everybody sang Cumpleaños Feliz. On Thursday, the party traveled by motorcade to Granada. With the temperature at 40ºC (104ºF), they stopped for ice cream (Michelle, triple-chocolate cone) before visiting the Cathedral (which contains the tombs of the Catholic monarchs, Ferdinand and Isabel, who funded Columbus’s voyages). Then to the caves of Sacromonte for a private flamenco performance. There, the First Lady reportedly danced a few steps por soleás. Reversing the usual Spanish timetable, the group had a very early dinner at the Parador San Francisco within the gardens of the Alhambra palace. Then, in the cool of the evening, they toured the Moorish Alhambra. The tasting menu at the parador reflected the Moorish heritage. To start were a trio of cold soups—traditional Andalusian gazpacho with tomatoes, Moorish-inflected ajo blanco con uvas, a white gazpacho made with almonds and garnished with grapes, and a cold melon soup with fresh mint. Next was a pastry filled with vegetables and spiced chicken, then monkfish in mozarabe style with a sauce of raisins and pinenuts. The main course was cabrito de Guejar Sierra con ajo y piminetos secos, baby kid from the sierra with garlic and dried peppers. Today Michelle and Sasha are at the beach. On the midday news, I saw video of Sasha splashing in the Mediterranean. I hope they had grilled sardines for lunch! And, I hope to hear if Michelle enjoyed Spanish food. Here are two recipes from Michelle Obama’s visit to Andalusia, Spain. Soak the bread in water until softened. Place the almonds and garlic in the container of a food processor and pulse until almonds are finely ground. Squeeze out the bread, discarding the crusts, and add it to the processor. Blend to a smooth paste. With the motor running, add the oil in a slow stream, then the vinegar and salt. Beat in ½ cup of water, then pour the mixture into a tureen, wooden bowl or pitcher and add the 2 ½ cups of cold water. Taste for seasoning, adding more salt or vinegar if needed. The soup should be fairly tangy. Serve immediately or chill the gazpacho. Stir before serving into bowls garnished with grapes. If you are unable to buy kid-goat, try this recipe with lamb chops. Make sure they are well trimmed of excess fat. You really only need the nugget of tender flesh. The dried peppers in the traditional recipe are called ñoras. They are plum-sized, bittersweet (not hot). They are fried or soaked in water, then the flesh scraped. Use a big spoonful of pimentón (paprika) if ñoras are not available. Heat the oil in a skillet and quickly fry the kid or lamb chops until browned on both sides. Remove the pan from heat. Drain off excess fat. Stir pimentón into the pan. Place bread, wine, garlic, cumin and oregano in blender container. Allow bread to soften for 5 minutes, then process until smooth. Pour this mixture into the skillet with the meat. Add 1 cup of water, salt and pepper. Bring to a boil, then simmer the lamb chops for 10 minutes. What in the world is the feminine for “grill meister”? Is she “maistresse of the grill”? Grill mistress? She with the art and craft, learned from a master, is my friend Donna Gelb who visited me in Spain a few weeks ago. Fuel for the fire. Donna Gelb uses olive wood to prepare coals for grilling lamb on my patio in Spain. She came to Spain from Languedoc (France), after teaching grilling classes there, preparing guinea hens over vieilles souches (aged vines). Donna inspired me to get out the grill, hardly used for several years, and cook up a meal for friends. Instead of grilling over charcoal, she suggested we make a fire using small branches of olive wood that I had stacked for use as kindling in the fireplace. I planned the menu using some of her recipes and she provided the expertise. In Spain, lamb is generally smaller than what is found in American meat markets. We used the thick part of the leg, without the shank end. Donna boned it, opened it flat and, skin side down, cut through the thickest muscle, then pounded it with the side of her hand so that the meat was approximately the same thickness. Boneless leg of lamb, opened up, is always a somewhat ragged, uneven piece of meat. 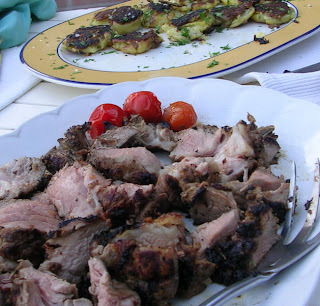 An Iranian cook introduced me to a marinade for lamb kebabs that I have adapted and used for grilling leg of lamb. Grated onion in the marinade both tenderizes and flavors the meat. I use a food processor to grate the onion. Grate 1 large onion and combine with 2 tablespoons olive oil, 2 cloves chopped garlic, 1 teaspoon fresh minced thyme, pinch of chopped rosemary, salt and freshly ground black pepper. Place the lamb in a non-reactive container and spread the onion mixture on both sides. Marinate at least 2 hours and up to 12 hours. Bring the meat to room temperature before grilling. I scraped off most of the onion marinade so that the meat would crisp rather than steam. I let the coals get very hot - hand just above the grate til about "3 mississippi" (or “3 matador” as we said in 7 Fires). The lamb was grilled directly over the coals. The grate was about 3-4 inches above coals. I let it get a good char on the first side without moving it (about 5 minutes) before flipping it. You can rotate it 90 degrees to cross hatch for another 3-4 minutes before turning it. Same on the second side until it feels almost but not quite done. It should still yield somewhat to the pressure of your finger. You can cut into an edge with a knife if you are really not sure, or use a instant read digital thermometer - about 120º F for rare BEFORE resting. Take it off BEFORE you think it is done - it keeps cooking while it rests, and it must rest about 5 minutes for juices to redistribute. You can always throw it back on if you need to. Grilled lamb, a little charred on the outside, pink and juicy on the inside, with grilled tomatoes and tapenade-crusted smashed potatoes. Adapted from Seven Fires: Grilling the Argentine Way by Francis Mallmann/Peter Kaminsky (Artisan 2009). Donna used small (2 ½ - 3 oz), all-purpose white potatoes for this recipe. They can be par-boiled in advance, but are best “smashed” while still warm. For the tapenade, we used my home-cured green olives, somewhat mushy after all these months, instead of black olives. The trick, Donna said, is to use a fair amount of olive oil so the potatoes crisp really well. They are really delicious! Put the potatoes in a pan and add the vinegar, 2 tablespoons of the oil, bay leaf, peppercorns and salt. Cover with cold water and bring to a boil. Reduce the heat to medium and cook until the potatoes are tender enough to be pierced with a skewer, about 12 minutes. Drain in a colander, but do not cool the potatoes. Place a potato on a clean dishcloth on a work surface, cover with another cloth and, using the palm of your hand, slowly and gently press the potato to flatten it. Transfer to a tray. Repeat with the remaining potatoes. Spoon the remaining 4 tablespoons oil over the potatoes. Heat a plancha or cast-iron griddle over medium-low heat until a drop of water sizzles on the surface. Put the potatoes on the hot surface, oiled side down, and cook until they are crisp on the first side, 4 to 5 minutes. Don’t move them! Transfer to a tray, crisp side down. Spread a heaping tablespoon of tapenade on top of the potatoes and press down lightly to compact the crust. Slide a wide spatula under a potato and, with one quick move, flip it over onto the hot plancha, tapenade side down. Lower the heat slightly. Repeat with remaining potatoes. Brown them for about 7 minutes, until the tapenade forms a crisp crust. Remove the potatoes as they are cooked and invert onto a serving platter, tapenade crust facing up. Serve immediately. This is the recipe from Seven Fires, but, as noted above, it can be freely varied. 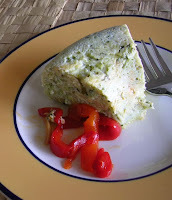 We used green Spanish olives, chopped in a food processor. Tapenade, a French condiment/sauce, also goes well with vegetables, grilled tuna, hard-boiled eggs or spread on toasts. Makes about 1 ¾ cups. Combine the olives, capers, zest, juice and thyme in a bowl. Gradually whisk in the olive oil. Season to taste with pepper. 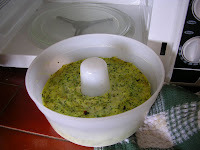 The tapenade can be kept, refrigerated, for up to 1 week. 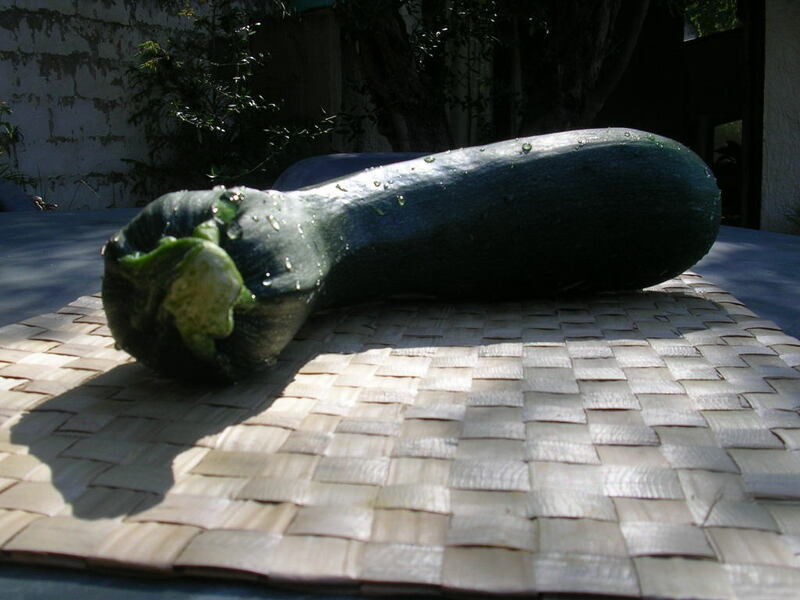 I invented this this cucumber ice to serve as a garnish for tomato gazpacho. I froze part of it in ice cube trays and used it in salad combos. For this meal, I chunked up the cucumber cubes a bit and combined them with chunks of watermelon and avocado and dressed them with salt and pepper, a little lemon juice, and extra virgin olive oil. Purple basil makes a fragrant garnish. Serves 8 to 10 as garnish for gazpacho or salad ingredient. Peel the cucumbers, cut them in half lengthwise and remove seeds. Cut into chunks. Puree the cucumbers in a blender with remaining ingredients. 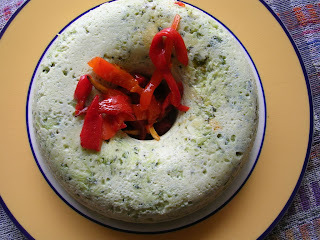 Pour the cucumber puree into two 9-inch metal cake pans (or ice cube trays). Freeze. To serve, remove the granita from freezer 5 minutes before serving. Use a fork to scrape ice into mounds. Add scraped ice to gazpacho immediately before serving. 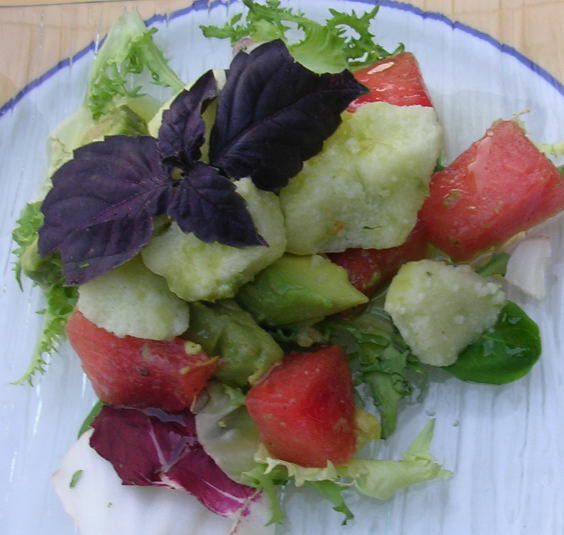 Or, if using cubes, cut them into chunks and add to salad immediately before serving.